Welcome to Skib: here you can rent skis and snowboards in Sauze d'Oulx with a simple click and collect near the slopes without queuing! Enter your dates and choose your outfit now. Everything will be ready for you right by the slopes! 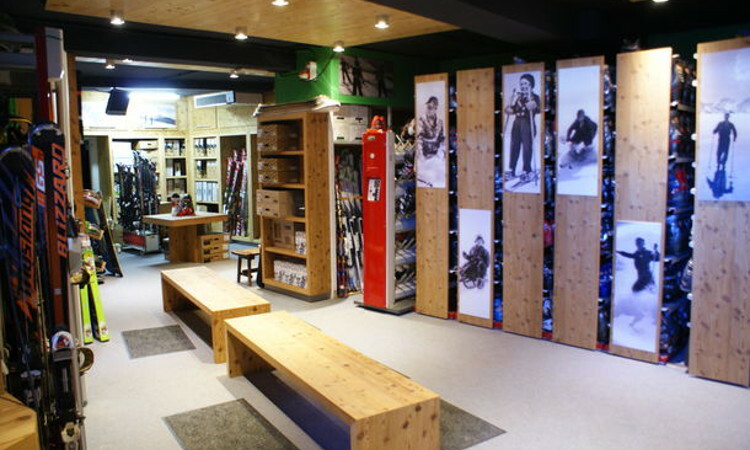 Maison Clataud Sport is the top in Sauze d'Oulx for renting ski equipment. Right in the centre of the resort and just 150m. from the ski slopes. Here you can find the best equipment and the latest from the world of skiing and snowboarding. An experienced workshop makes sure you always get well-prepared skis. Choose from a large selection of accessories and enjoy a wonderful holiday on the slopes. What are the advantages of Skib.com renting? Choose opposite the kit you prefer to suit your level and style. On the next page you can add more and choose from accessories like boots and helmet. The sticks are always included with your skis. To share the fun try using a GoPro camcorder!For the youngsters there is children's ski hire or even fun sledding for the first approaches to the world of winter sports. All equipment can be insured against theft and damage, so you can ski without any worries! Holidays in Sauze d'Oulx: useful advice from Maison Clataud. Also known as "the balcony of the Alps" Sauze d'Oulx has a prime location in the landscape of the upper Val di Susa. In addition to the 60 ski slopes you will find a wide range of entertainment and a vibrant nightlife: bars, restaurants and discos for a truly unforgettable holiday!